NIGHTSCOUT is an open source, do it yourself project (you do all the setup yourself) that lets you access real-time data from your Dexcom G4 CGM on web browsers by smartphones, computers, tablets and the Pebble smartwatch. OK, so what does that really mean, in plain English? 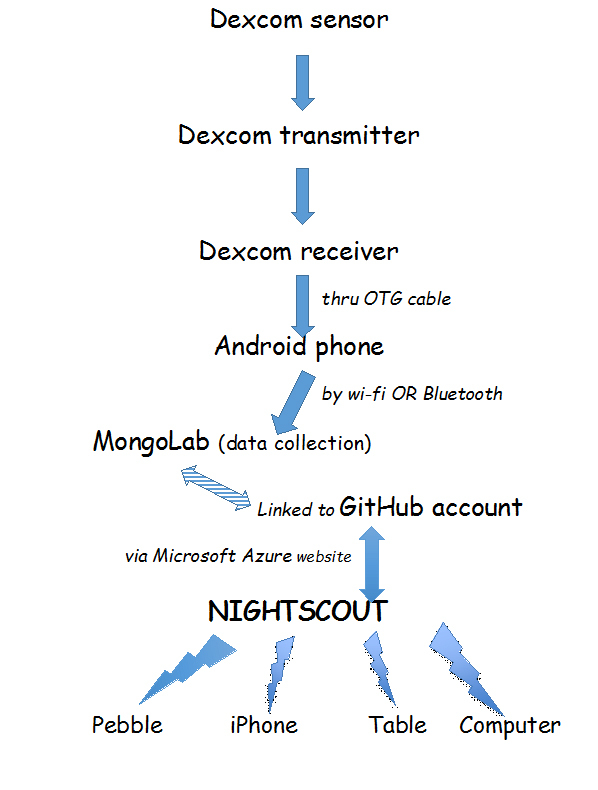 Nightscout is an application that is written by programmers that allows you go transfer your Dexcom G4 readings to an Android phone, which, by Bluetooth, sends the data to the cloud (by a technical complicated way) into the Nightscout application. Then any device that has the Nightscout application loaded can download your readings, onto their phones, computers or tablets, from anywhere in the world. The purpose of NIGHTSCOUT is to allow remote monitoring of glucose levels by Type 1’s and others, such as parents, teachers, medical folks and spouses, by monitoring NightScout on their smart phones, computers or tablets. NIGHTSCOUT is not a company but rather a system developed by software and code engineers who were impatient about waiting for the big companies to let us have our data … hence the slogan: #WeAreNotWaiting. In fact, they feel very proud that their efforts are, in part, responsible for pushing Dexcom to bring Dexcom Share to market.